What began as a literary project for her own family has grown into a book touching lives across the nation, for an LDS mother of four and new grandmother. The means? A little-known children's classic entitled Thunder Cave, and her unflagging desire to share it with families living today. The book, out-of-print for over fifty years, is part of the childhood memories of parents, grandparents, and great grandparents. Their children have grown up hearing about it. And wondering. Now they are reading it -- from Washington to New Mexico, to Illinois and beyond -- and in a version that meets the needs of a changing world. The message of this modern version of Thunder Cave is goodwill toward all people, and a bright hope for the future. Jones says, "Through Thunder Cave, I first met human beings with a different color of skin -- met them, and loved them." Written in 1932 by Jeremiah Stokes (1877-1954), illustrated by Jack Sears (1875-1969), Thunder Cave's roots lie in the South, where both Stokes and Sears served LDS church missions at the turn of the last century, and later returned -- Stokes for a law degree, Sears for art. They took their love of the peoples of that diverse region back with them to their native Utah, a love that is reflected in Thunder Cave's story and illustrations. Begun scarcely four decades after the Civil War, the story's heros are two young Afro-American boys who embark on a dangerous quest to find their lost parents. Their quest takes them into the depths of Thunder Cave, and -- ultimately -- into the fabulous Toy Shops of Kris Kringle, where they learn the rule of conduct basic to all the world's great religions: Love thy neighbor as thyself. Once discovered, who can forget the story's timeless enchantment and characters?  The mischievous little Jackawees?  The inseparable Grey Wolf and Crow Foot?  The good Giant Wigwah?  Or the talkative Owl named Solomon Swift? Their adventures have touched the lives of generations of children! "Thunder Cave was progressive for its day. In fostering attitudes of tolerance and respect among people of differing beliefs, race, and customs, it is also a story for our times," says award-winning author Denise G. Jones, who has combined Stokes' 1932 and revised 1945 editions with cultural sensitivity, rewriting whenever necessary to bring this unforgettable story up to today's standards of children's literature while maintaining the integrity of Stokes' writing and style. The resulting 2001 edition combines the charm and flavor of the original versions with more-fully developed characters, plot, and action, as well as a more universal point of view. "Children today need books like Thunder Cave that help them transcend global and individual human differences," Jones says. "Full of hair-raising adventure and humor, with a touch of mystery and magic, it shows children that they can survive troubled times and that help comes in unexpected ways. They also learn that the key to the Basement of the Mountain lies deep within themselves." The "Millennium Edition" of Thunder Cave is the product of years of research into Stokes' writings, and also into Native American culture, and includes Thunder Cave history and biographical sketches on Stokes and Sears with input by relatives of each. Taking nearly two decades to complete, the result of Jones' efforts is a fast-paced, smoother-flowing story, that's "listener-and-reader-friendly" with simplified dialect -- though not changed altogether. "The dialects of the Wilson family and Indians are a necessary part of the flavor of Stokes' story," Jones explains. In addition to being a great story, Jones says, "It's a fun way to teach children values." A native and resident of Utah and Latter-day Saint mother, Jones has found great satisfaction in bringing the story to life for the children of the 21st century. The reading level for the "Millennium Edition" of Thunder Cave is 4th-7th grades; listening level is age 5-up. Now her edition of Thunder Cave has made the delightful "adventures of Jasper and Zebbie and the good Giant Wigwah" available for children today, and generations to come. A 10-year-old in Utah listening to it read aloud, says proudly, "We're reading Thunder Cave. I like Grey Wolf. He's a chief!" An 18-year-old reader in Nevada, who can hardly put the book down, is already looking forward to sharing it with the children she will one day raise. 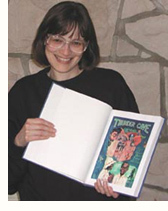 "After all," Jones says, "entertaining children while teaching high standards and values is what Jeremiah Stokes and Jack Sears created Thunder Cave for." Information on Thunder Cave can be found online, with biographical pages, book images, and excerpts from the 1932, 1945, and 2001 editions. "I really enjoyed reading this book. It is funny and uplifting. I particularly like the boys "Jaspah" and Zebbie. I think that Thunder Cave is a book with great morals inside and it gave me the sense of family unity that the boys had with their parents as well as the importance of friendship and love. I am really glad to have read it and I hope that I can read it one day to my children. It is a very Christ centered book. I want to thank Sister Jones for her work. Her children must be proud of her."